Comet Temple 1Courtesy NASA/JPL-Caltech/UMDThe following is from a listserv I am on that I thought was interesting. On February 14, NASA's Stardust-NExT (New Exploration of Tempel 1) mission will encounter Comet Tempel 1, providing a unique opportunity to measure the dust properties of two separate comets (Wild 2 and Tempel 1) with the same instrument for accurate data comparison. 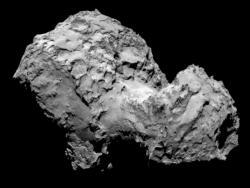 The encounter will also provide a comparison between two observations of a single comet, Tempel 1, taken before and after a single orbital pass around the sun. NASA's Stardust spacecraft will fly within 200 kilometers (about 124 miles) of Comet Tempel 1 on February 14, 2011, at about 8:36 p.m. Pacific Standard Time. 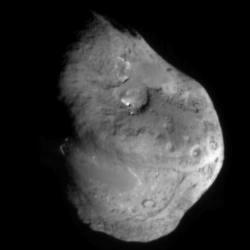 NASA's Deep Impact mission observed Comet Tempel 1 in the summer of 2005, as the comet was inbound toward the Sun on its approximately 5.5-year orbit between Mars and Jupiter. Deep Impact's primary mission was to deliver a special impactor spacecraft into the path of Comet Tempel 1. The spacecraft -- and many ground-based observers -- observed the impact and the ejected material. Scientists were surprised the cloud was composed of a fine, powdery material, not the expected water, ice, and dirt. 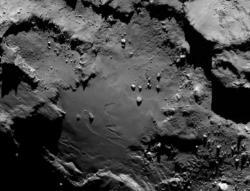 The spacecraft did find the first evidence of surface ice on the surface of a comet instead of just inside a comet. The Stardust-NExT mission is a low-cost use of an in-flight spacecraft redirected to a new target. Prior to its tasking for Tempel 1, the Stardust spacecraft successfully flew through the cloud of dust that surrounds the nucleus of comet Wild 2 in Jan. 2004. The particles of cometary material and gathered during this flyby were then returned to Earth aboard a sample return capsule which landed in the Utah desert in January 2006. Hubble image of Comet 103P/Hartley 2Courtesy NASA, ESA, and H. Weaver (The Johns Hopkins University/Applied Physics Lab) Periodic comet 103P/Hartley 2is currently visible high in the evening sky. Learn more here. 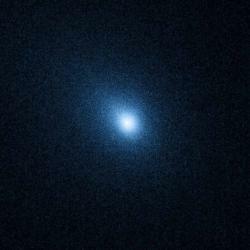 The Deep Impact spacecraft has been redirected to fly past Comet 103P/Hartley 2 on November 4. Read more about that here. Scratched and dented: This infrared image of Jupiter shows the impact site where something hit the planet last week.Courtesy NASAIt's tough being the big guy on the block. Last week Jupiter got nicked by something flying through space. And an amateur astronomer discovered it. Read more about it here! It's just pretty, that's all. An impressive display of meteors will move across the sky on Friday, August 12, (2005) when the Perseid meteor shower becomes most visible. Peak viewing times will be from 2 a.m. until sunrise that morning, according to NASA experts. Because of interference from urban lights, viewing is best outside of the city. The Perseid meteor shower occurs every summer, when the tail behind Comet Swift-Tuttle intersects with Earth's orbit, causing comet dust to enter Earth's atmosphere. Meteors from the comet travel from the direction of the constellation Perseus, which gives the shower its name.